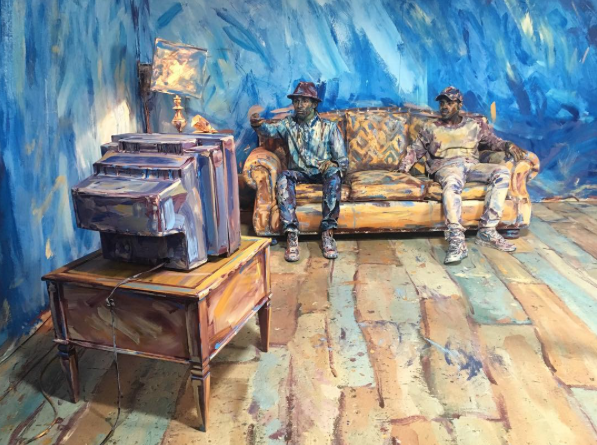 Alexa Meade is an American installation artist best known for her portraits painted directly onto the human body and inanimate objects in a way that collapses depth and makes her models appear two-dimensional when photographed. Lil Buck is is a Los Angeles-based dancer from Memphis, Tennessee who specializes in a style of street dance called jookin’. He gained popularity after director Spike Jonze used his cell phone to record an interpretive performance of “The Dying Swan” by Lil Buck and Yo-Yo Ma. Jon Boogz is a movement artist & choreographer who has choreographed work for a multitude of icons including ballet’s Mikhail Baryshnikov, Naomi Campbell, Latin star Gloria Estefan and many more. Jon has also choreographed many pieces for FOX hit dance TV show “So you think you can Dance.” His choreography is currently on display at the always-sold-out MJ ONE Cirque Du Soleil show at Mandalay Bay in Las Vegas. Known for his edgy artistic street/contemporary style, he continues to push the boundaries of movement artistry. Here is a still from the piece, scheduled to go up on our SVLA1 screen on September 5. The piece will play at the top of every hour for the duration of a month. The SVLA1 screen is located at 901 W. Olympic Blvd in the heart of Downtown, Los Angeles. Special thanks to Animi for producing this piece.